TL:DR: With technologies like artificial intelligence threatening to displace workers, employers and employees are being forced to rethink the nature of work. Reskilling, with a focus on both hard and soft skills, will be important to help companies stay competitive and allow employees to stay relevant. The education system must also evolve to prepare the next generation for the jobs of tomorrow. Depending on whether you’re a glass-half-empty or half-full kind of person, you’re either eagerly awaiting the day robots take over your job or dreading the day you draw your last paycheque as automation completely takes over. According to a McKinsey report, half of the current work activities are technically amenable to automation, and up to 800 million jobs worldwide could be wrested from human hands by 2030. But there may yet be cause for optimism—the report also highlights that technology historically spawns more jobs than it destroys. Nonetheless, the actions of governments, enterprises and individuals in the present will go a long way toward determining the future of employment. 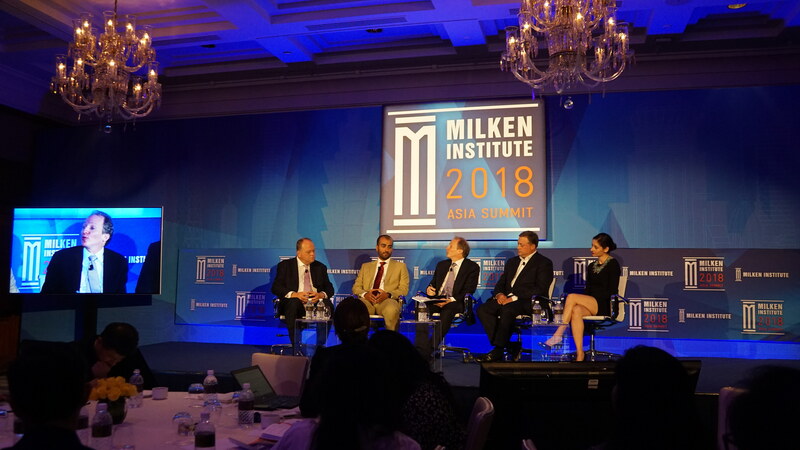 At the Milken Institute Asia Summit, speakers at the ‘A brave new world: preparing for the jobs of tomorrow’ panel discussion shared their insights into the changing nature of work and how to stay employed in the future economy. Mr Gianfranco Casati, group CEO of growth markets, Accenture, moderated the panel, which comprised Mr Achal Agarwal, president, Asia Pacific, Kimberly-Clark Corporation; Mr Olivier Legrand, managing director and vice president, Asia Pacific and China, LinkedIn; Mr Yasukane Matsumoto, founder and CEO, RakSul Inc.; Mr Brian Rogove, founder and CEO, A-Star-Education; and Mr Ole Ruch, head of global strategy, WeWork. Most familiar with the disruptive potential of technology in the labour markets is Mr Matsumoto, whose company manages thousands of print jobs with just 30 employees. It does so with a proprietary platform technology that connects customers to printing companies in Japan. RakSul is, in essence, the ‘Uber’ of print. Unlike traditional [print] companies that scale their operations by hiring and purchasing additional printers, RakSul crowdsources human labour and assets, allowing it to operate with a small team of full-time staff. But Mr Matsumoto does not see his platform as taking away jobs. Rather, he thinks it empowers individuals who may have otherwise been employees to become entrepreneurs. “Our platform creates opportunity for our partners—whether they be individuals or SMEs—to flourish,” he said. Even as companies try to figure out how to create a conducive workspace for millennials, they must also address the challenge of upgrading the skills of their employees. “Churn is an expensive thing—having to renew your workforce every two to three years is very scary if you are running a large-scale business,” said Mr Legrand. Yet, it would seem many companies do not realise this. “When we asked executives if they are willing to accelerate their investments [in skills training for their employees], only three percent of them suggested that they had it in their plans,” Mr Casati shared. In Mr Legrand’s opinion, it boils down to companies making a conscious decision about the amount of reskilling needed for them to retain talent and remain competitive. “Do I have to reskill 100 percent? Probably not. [But maybe I can] identify people with 50 to 60 percent of the skillsets that I need for a job and teach them the rest,” he suggested. No discussion about jobs would be complete without touching on how education needs to change. Mr Rogove noted that the East and West have slightly different approaches to education, and that perhaps finding a middle ground between the two may be the best way forward. He also recommended that parents teach their kids to be trilingual—they ought to be fluent in English, Chinese and coding, because “those are the going to be three most important languages to know”. For Mr Legrand, simply teaching skills is not enough. Providing a safe space for children (or adult workers, for that matter) to exercise those skills is equally important. Done correctly, Mr Agarwal thinks that educators and employers can produce a workforce that “has intuition, imagination, influencing skills, impatience and the ability to inspire”. “You can’t predict what role you’re going to be in tomorrow, so you’d better be agile and learn fast. I’m in the optimistic camp,” said Mr Agarwal.